Olympic sprint star and murder suspect Oscar Pistorius will appear in court on Tuesday for a bail hearing that promises to be a prelude to a battle of legal heavyweights.Pistorius’ trial for the Valentine’s Day killing of his model girlfriend will feature some of South Africa’s best lawyers and a tough prosecutor who is famous for jailing the former police chief for graft. The man whom the state has called on to prosecute the case is Gerrie Nel, an experienced and highly qualified lawyer known to be thorough. He boasts a record of successfully prosecuting many of the high-profile cases he has handled. Nel is most famous for sending to jail ex-Interpol president and South Africa’s former police chief Jackie Selebi after proving he had taken bribes from an organised crime network. He will argue that Pistorius planned the murder of his lover Reeva Steenkamp, 29, who was shot four times including in the head at his home in the early hours of Thursday. Premeditated murder carries a life term and it is not normally easy for suspects to secure bail. 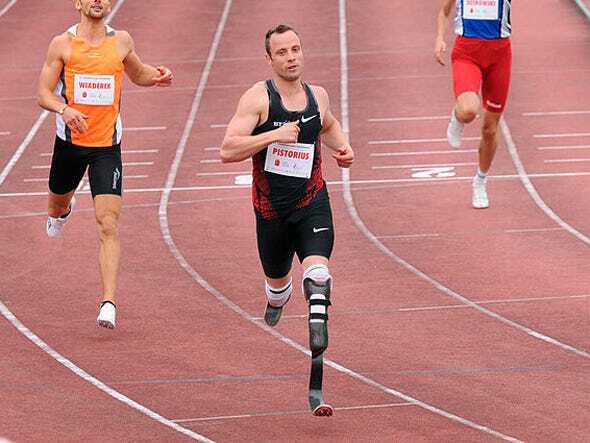 The 26-year-old double amputee athlete has an uphill battle to prove there are exceptional circumstances for him to secure bail, otherwise he faces a lengthy period of pre-trial detention. Experts said it is highly unlikely Pistorius will use his disability to argue for his bail. “Oscar has demonstrated to the world that he is as very skilled and almost as good if not better than able bodied persons,” said Stephen Tuson, criminal law professor at South Africa’s University of Witwatersrand. Pistorius will also have to prove that he does not constitute a danger, is unlikely to flee, will not interfere with witnesses or investigations or try to bribe justice officials and that his release will not lead to public rioting. Criminal defence lawyer William Booth, who is not involved in the case, predicted he would be freed on bail. Bail or no bail Pistorius faces a tough ride ahead, in a case that could take years to come to court. His family has strongly denied that the sprinter intentionally killed his model girlfriend. But prosecutors are expected to argue the murder was premeditated. Such a killing is planned, conceived and executed, and in South Africa can often involve a hit man. “Normally when you have alcohol (linked) or love triangle or a domestic argument which escalates and get out of hand, I would not consider that pre-meditated murder,” Tuson said. Booth agreed premeditated murder would be difficult to prove. Also on the Pistorius team is Kenny Oldwage, who acted for the driver in a 2010 accident that killed former president Nelson Mandela’s great-grandchild Zenani. The driver was acquitted. Pistorius has also hired one of the country’s top forensic pathologists Reggie Perumal. Perumal has previously been called in to testify about last year’s shooting of 34 striking miners by police at the Marikana mine, as well as on the mysterious death of Zimbabwe’s former army general Solomon Mujuru. Handling public relations will be Stuart Higgins, a former editor of British tabloid The Sun, whose lengthy list of clients include British Airways, Chelsea FC and Manchester United football club.